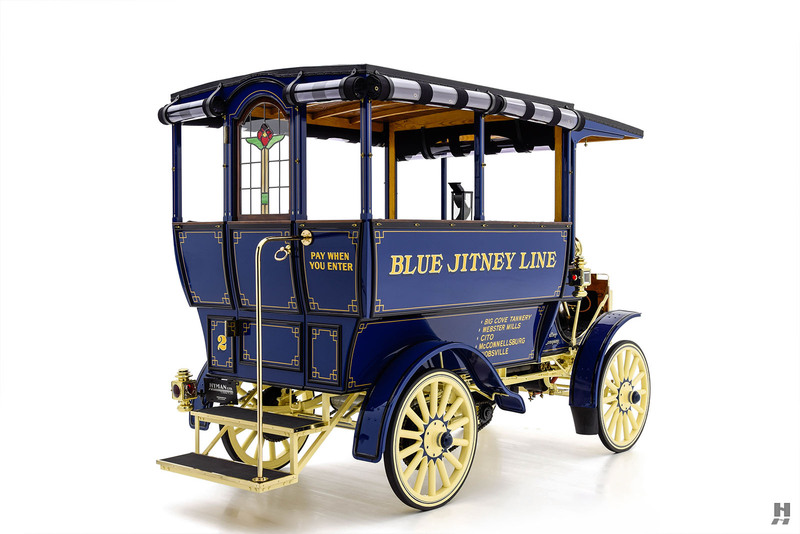 The Chicago Pneumatic Tool Company was founded in 1894 by John W. Duntley, producing a line of new labor-saving tools for construction and heavy industry. 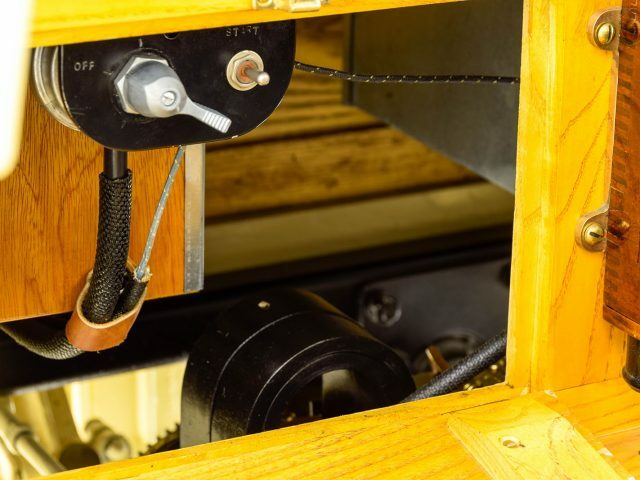 In 1901, Duntley had partnered with steel magnate Charles M. Schwab who invested heavily in Chicago Pneumatic, leading to the patent of the world’s first pneumatic hammer. 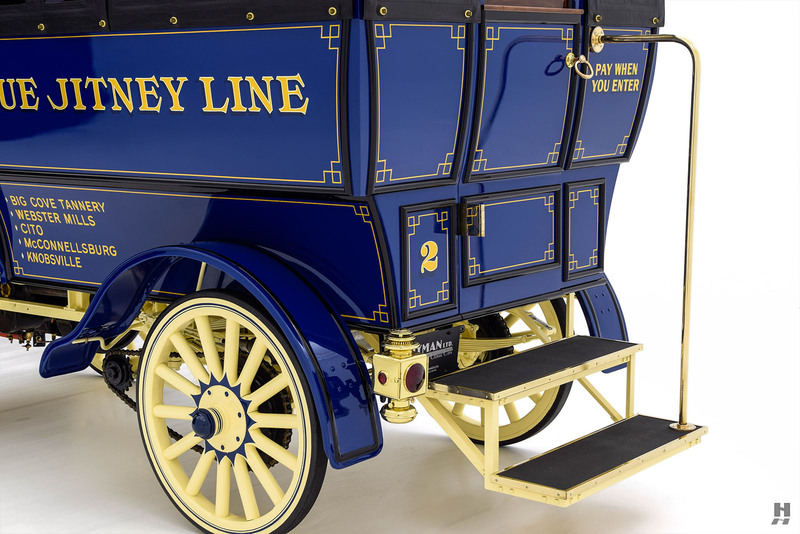 By 1904, the company had expanded dramatically to include offices in Canada, England, and Europe. 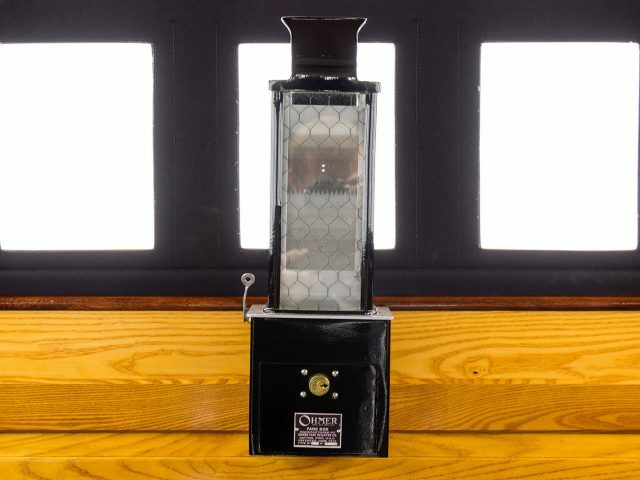 The product line had also grown substantially to include stationary engines, mining, and oil-drilling equipment. 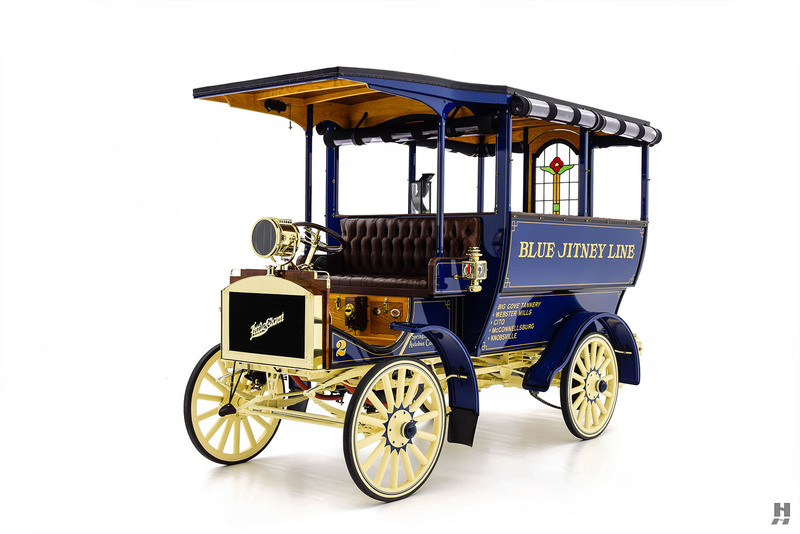 Between 1911 and 1917, the company supplemented its mining tools with a line of mid-sized utility trucks called “Little Giant.” Features of the Little Giant included a specially-built 1-ton chassis with a horizontally-opposed two-cylinder engine and a two-speed planetary gearbox. 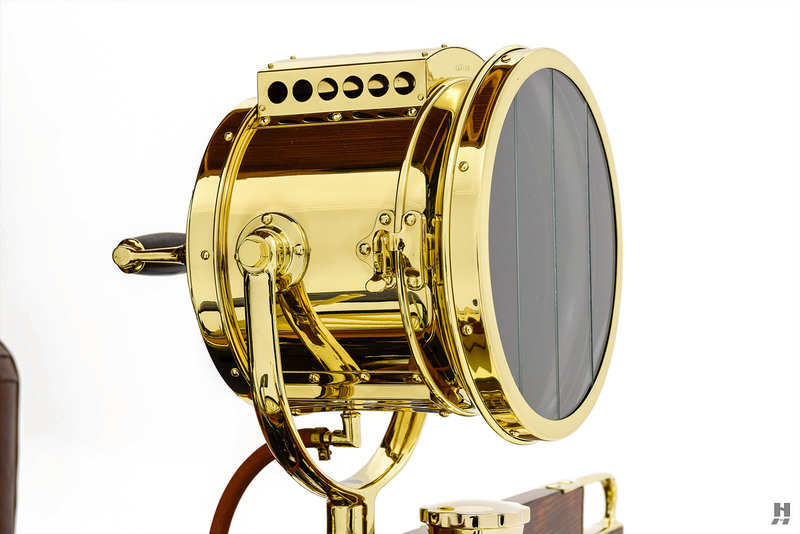 It was built to be rugged and versatile, and easily adapted for use in a wide array of industries. 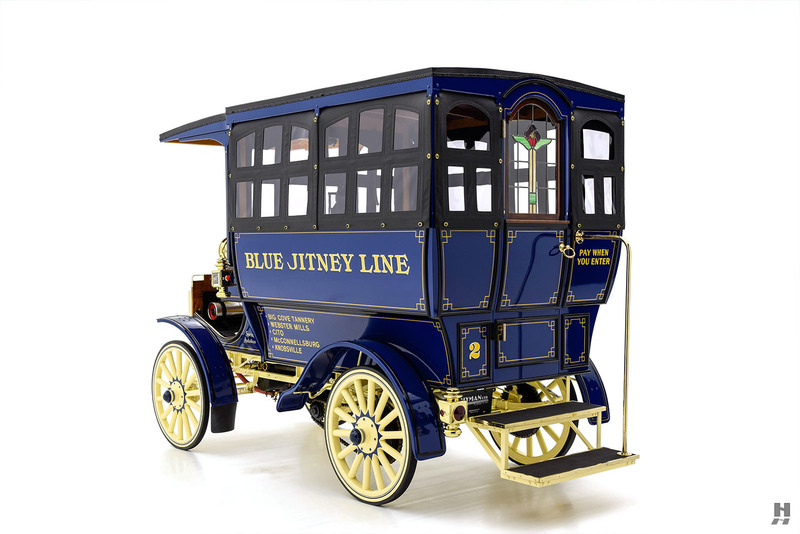 CP contracted with outside coachbuilders to build a series of “factory” standard bodies such as a bus, stake-bed truck, or panel truck. 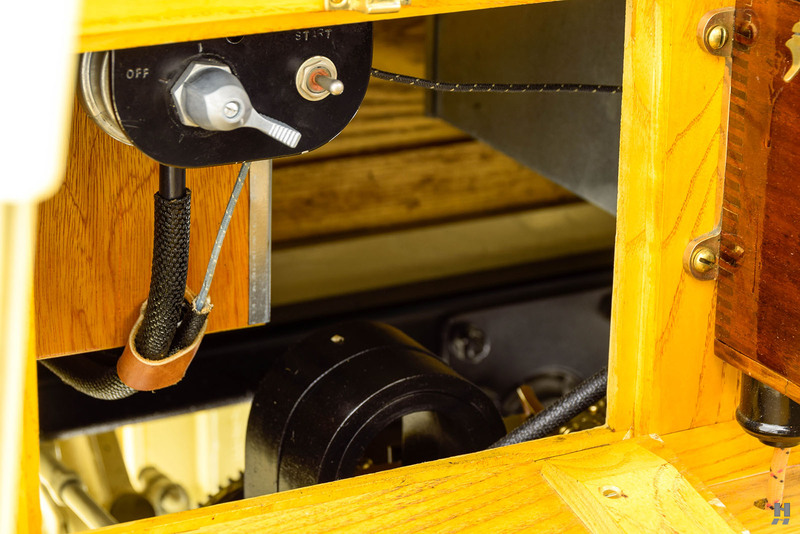 Buyers with more specific needs could purchase a bare chassis to be upfit to meet the requirements of their particular industry, and Little Giants are known to have been used in fire service, commercial hauling, and mining. 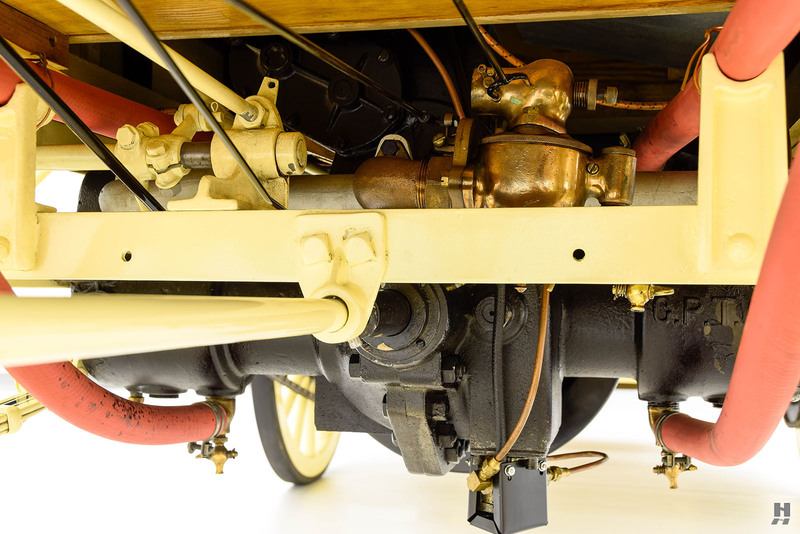 As the automobile and truck manufacturing business became increasingly specialized, Chicago Pneumatic ended production of the Little Giant to focus on their industrial tool business. 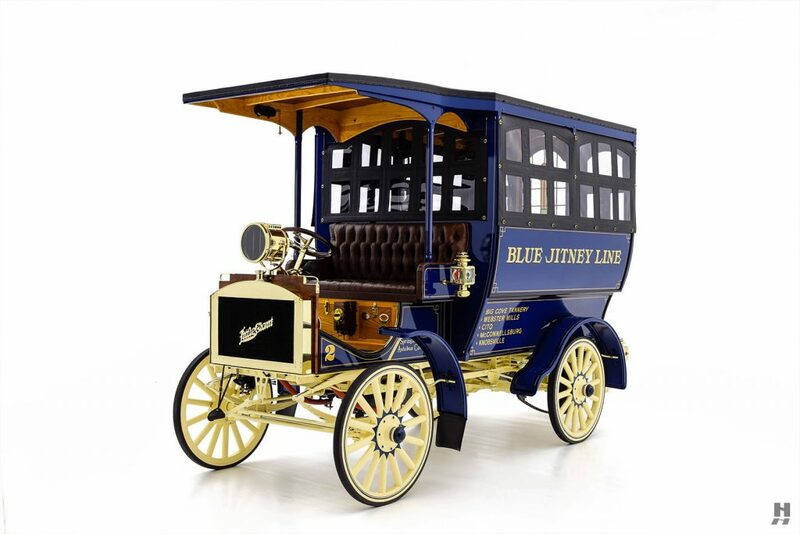 Precisely how many were made by the time production ended in 1917 isn't known, but as with any heavy duty commercial vehicle, attrition was high, and it is believed that fewer than ten examples exist worldwide today. 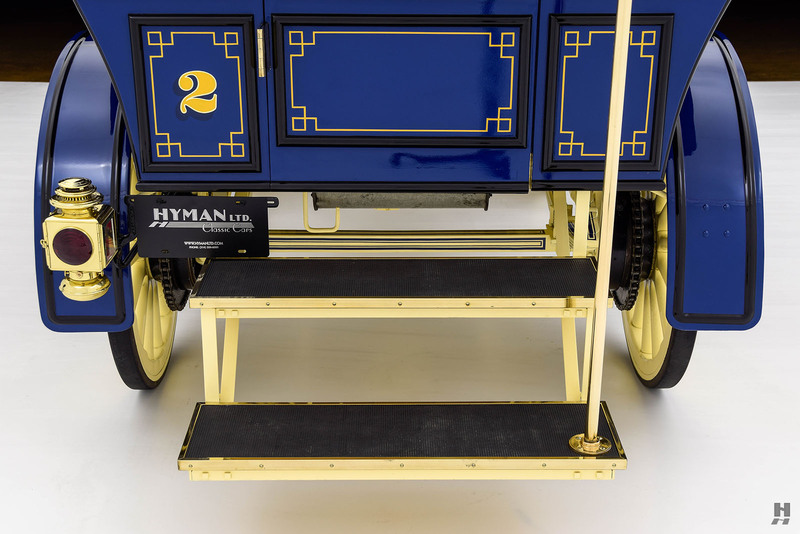 This delightful 1912 Little Giant Model D was discovered in 2009 by a collector and restorer from southern Pennsylvania. 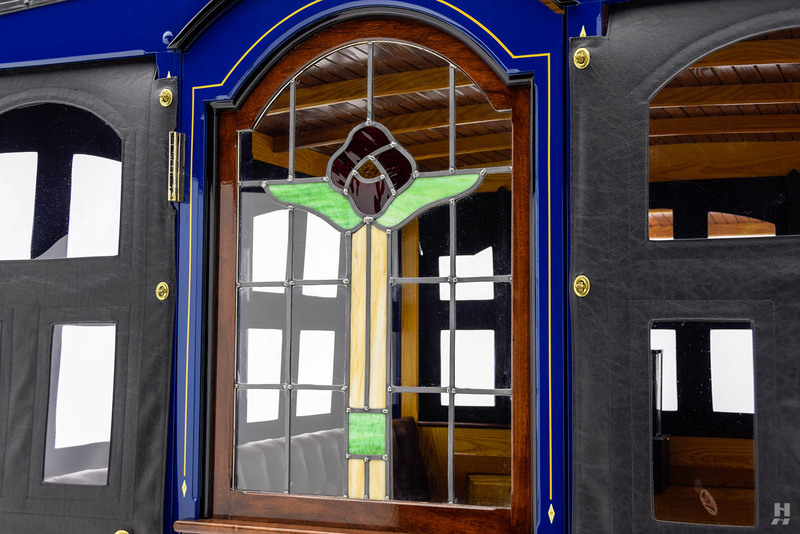 The restoration had been started, though the project had stalled, but he saw it as a unique opportunity to complete the project to his own high standards. 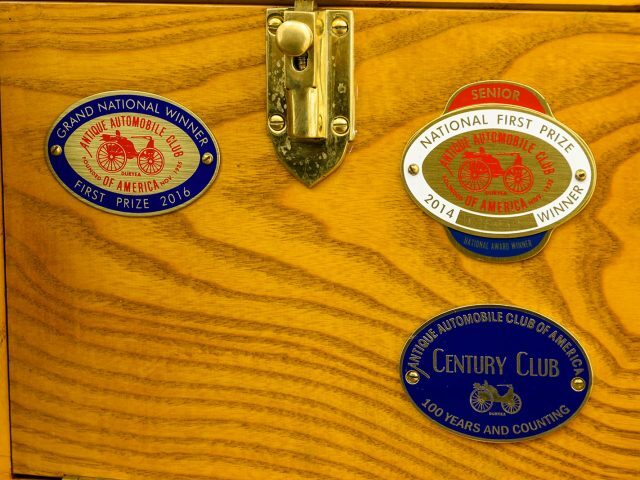 He brought the Little Giant home, where he commenced a complete, nut and bolt, concours-quality restoration. 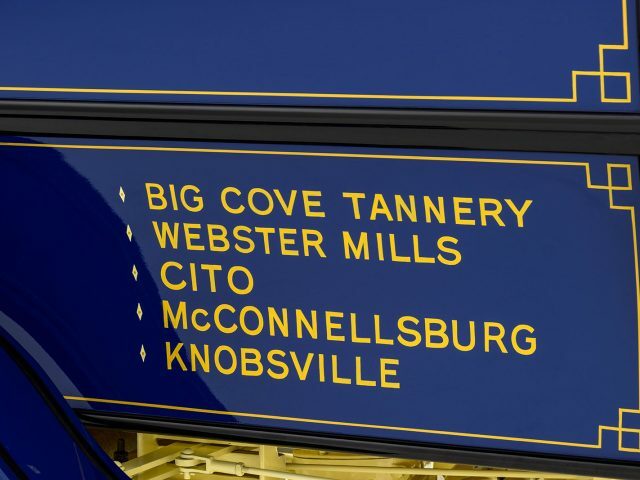 With so few survivors and little information available, it was a formidable project from the start. 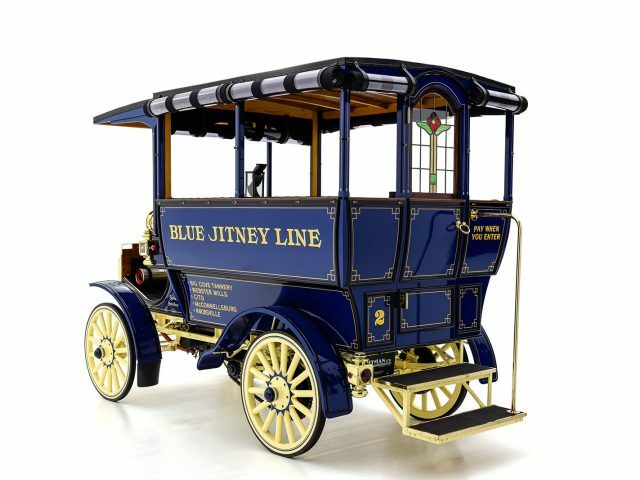 A restored example (with a utility truck body) was found in the USA, which he carefully measured and photographed to compare with this project. 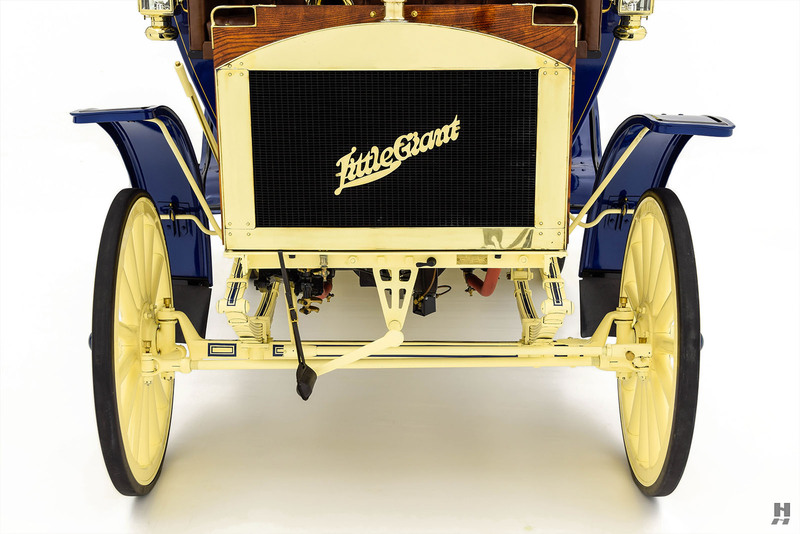 Using period brochures and advertisements as reference, the Little Giant was carefully restored, with much of the work done by the owner, with spectacular results. 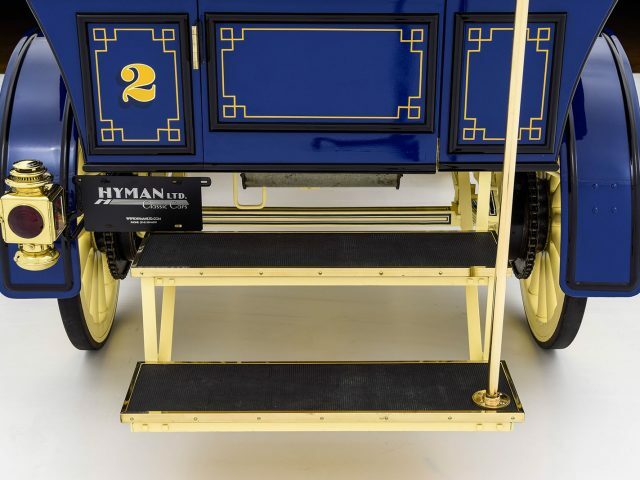 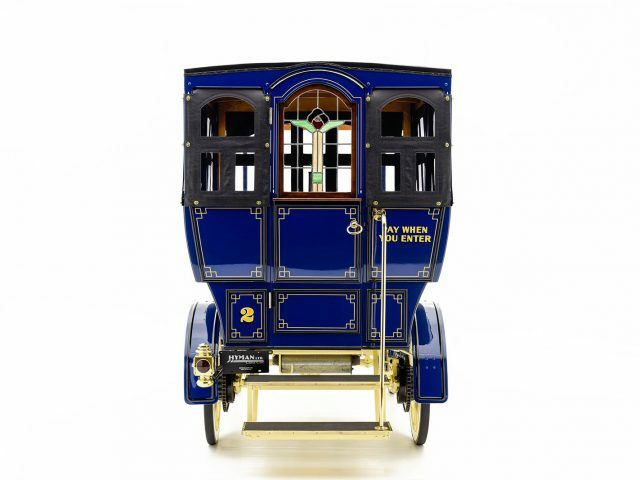 Still appearing very fresh from restoration, the Little Giant is a truly exquisite piece, painted a beautiful bright blue against a pale yellow chassis and accented with period appropriate gold lettering and striping. 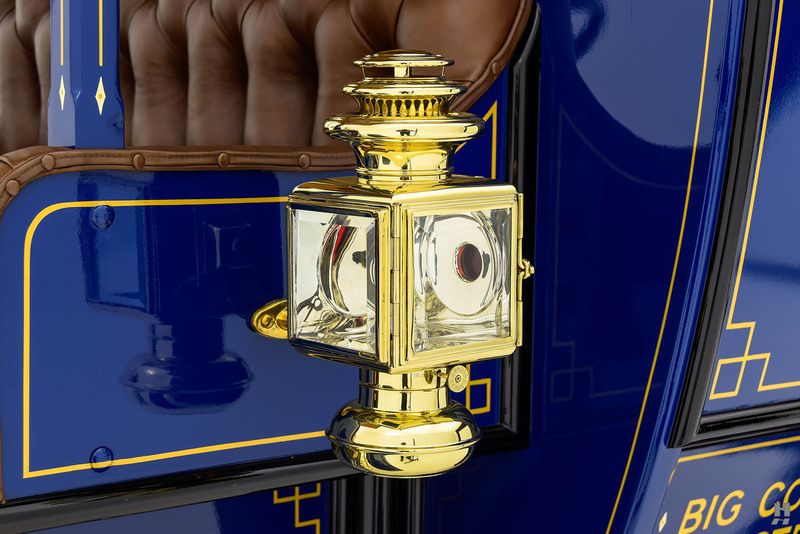 The body is magnificently crafted and detailed. 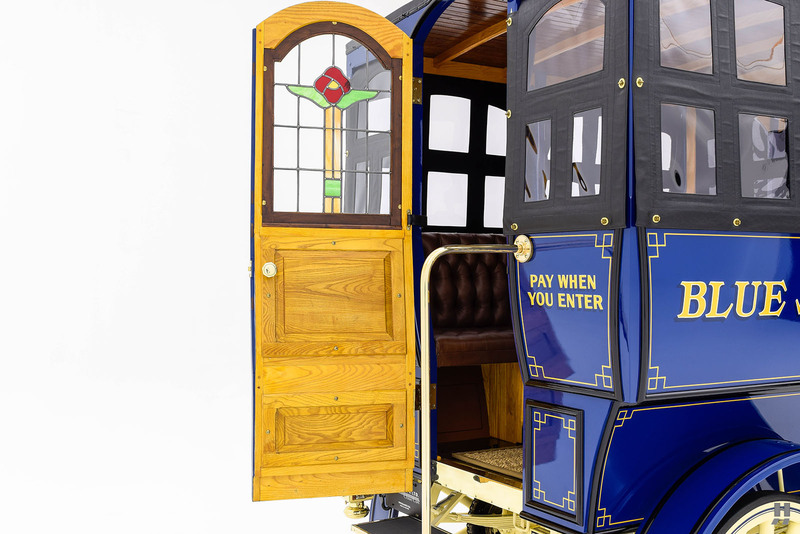 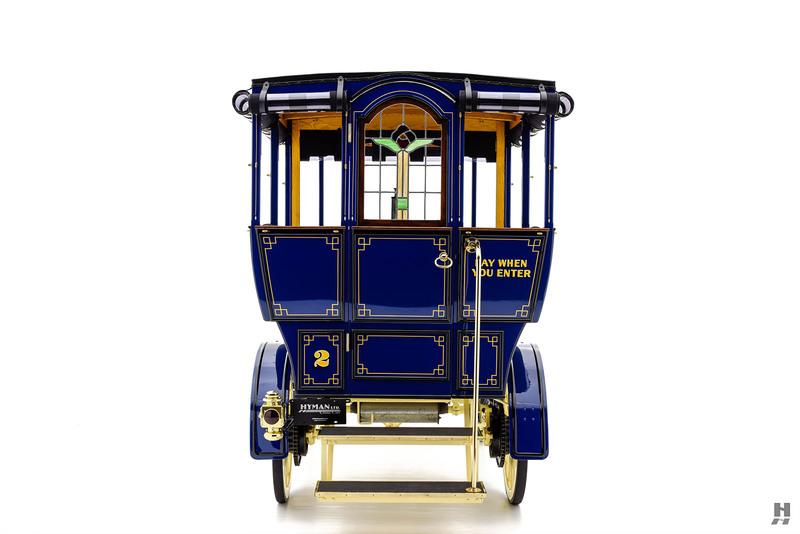 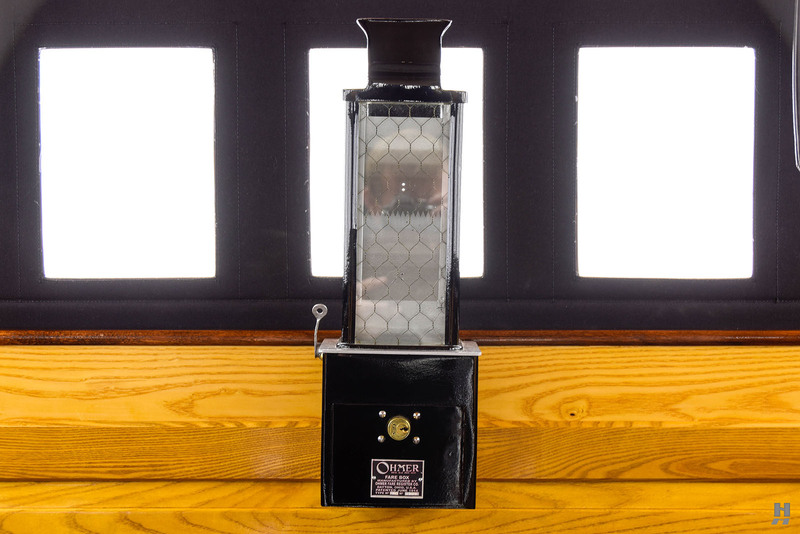 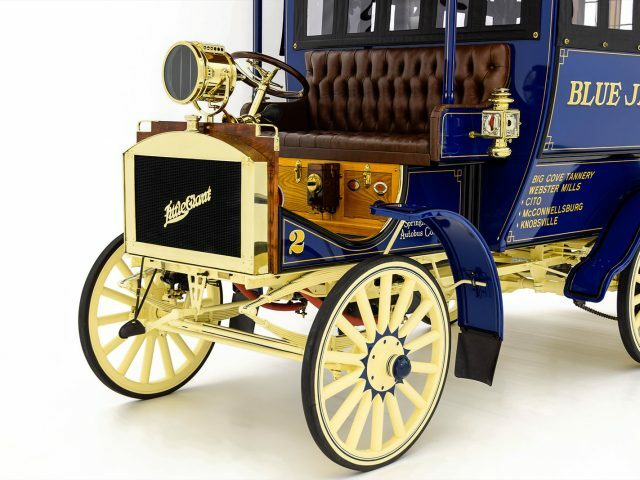 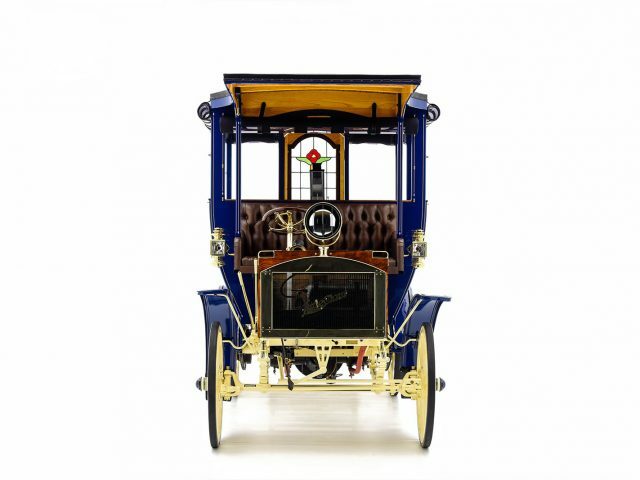 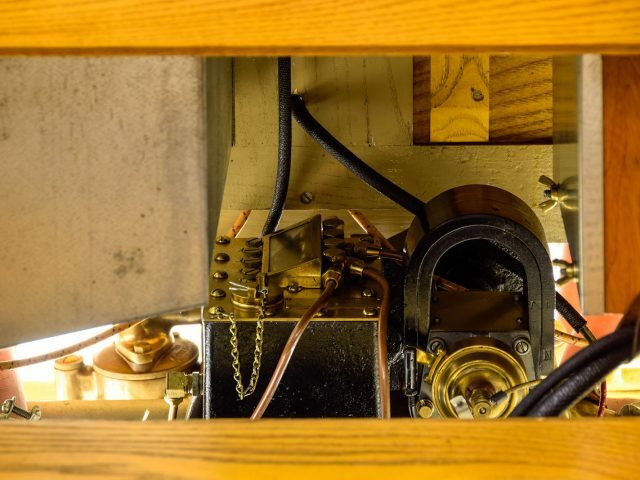 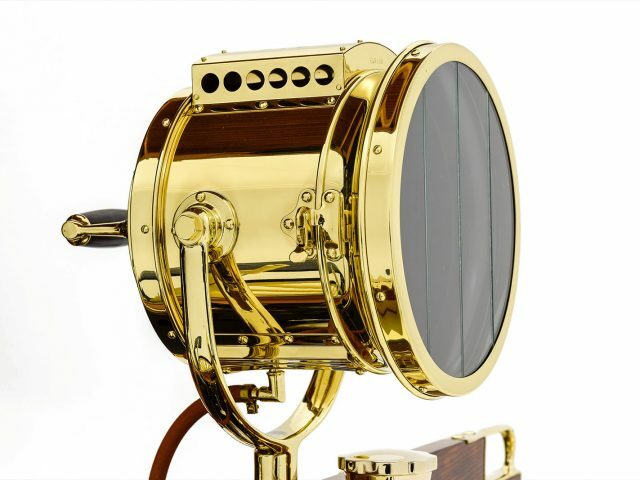 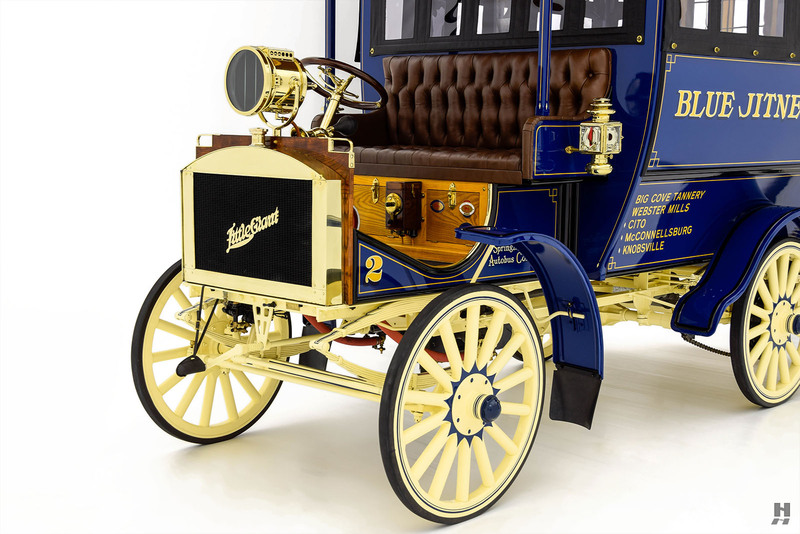 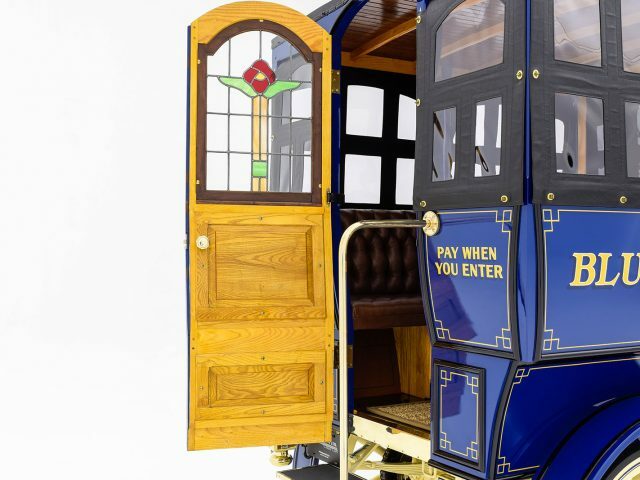 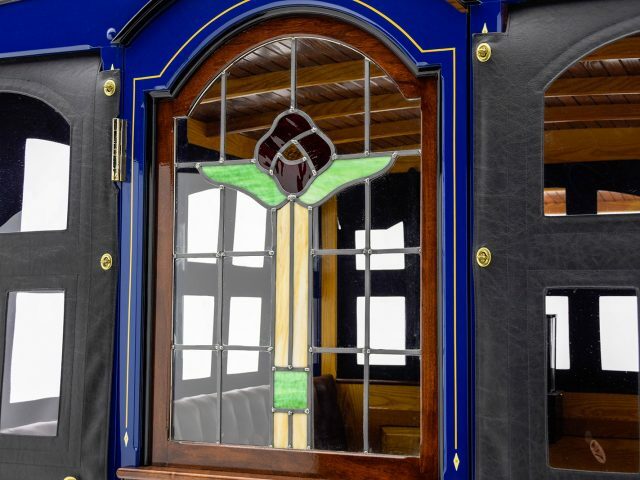 Typical for the era, detailing is ornate, with gorgeous brass lamps and accessories, and a stunning stained-glass rear door, a passenger counter for the driver and a coin receptacle in the passenger compartment. 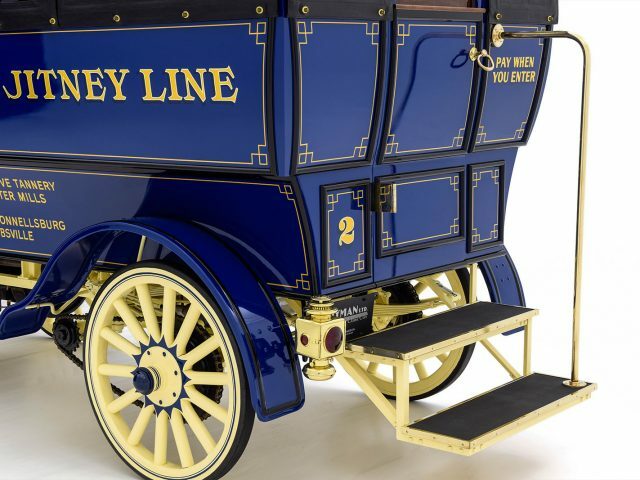 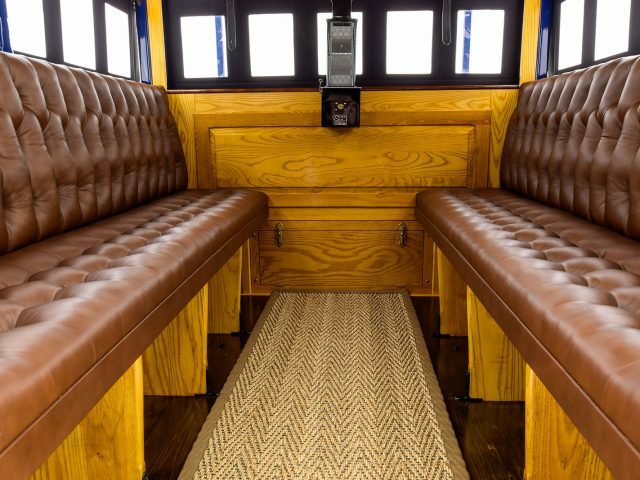 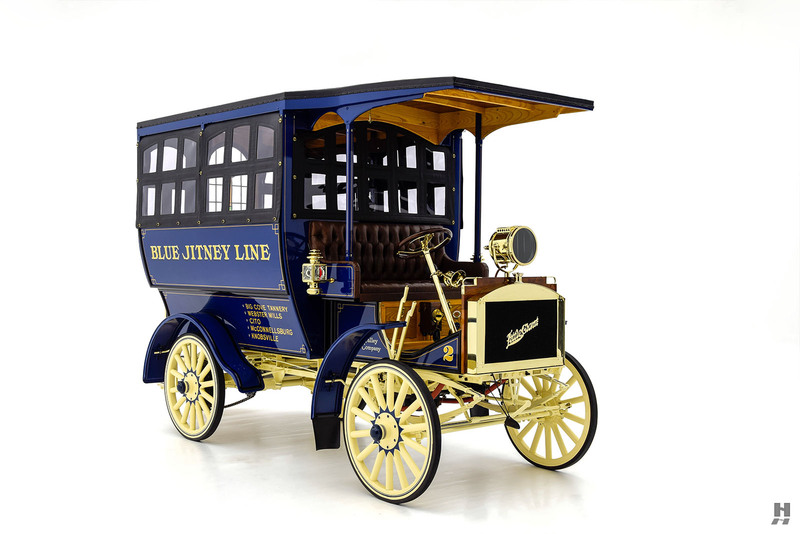 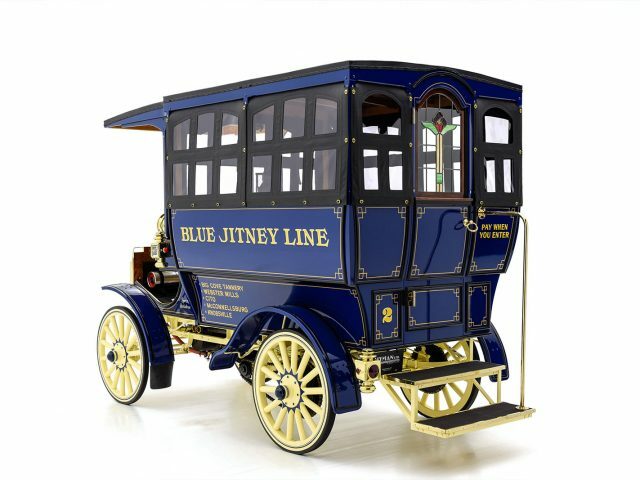 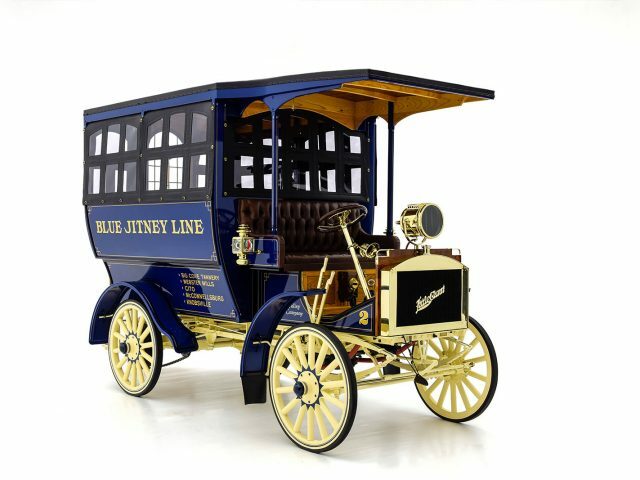 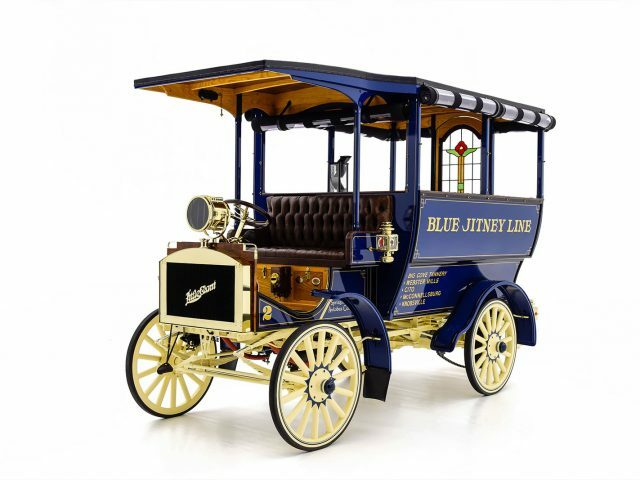 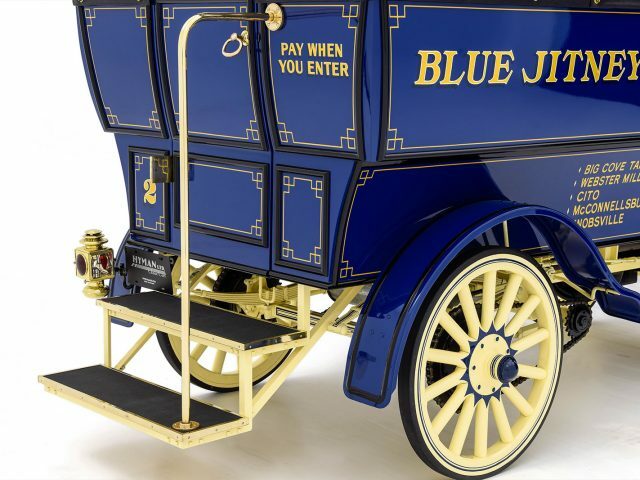 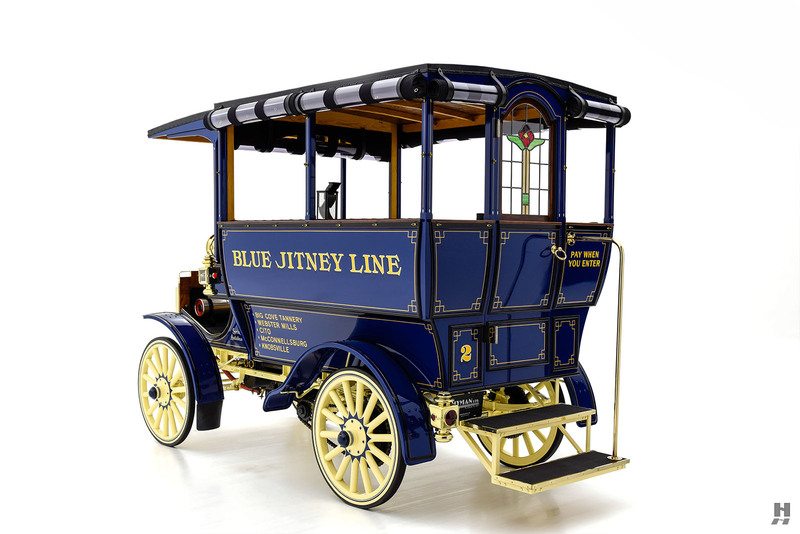 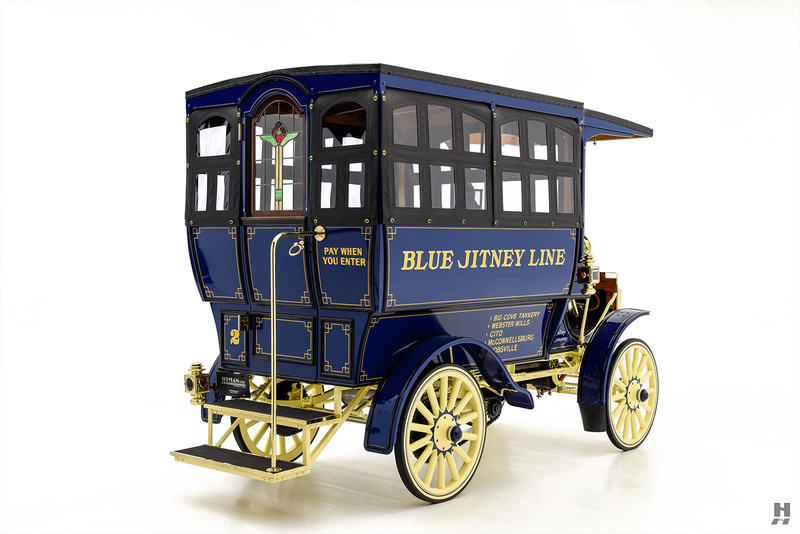 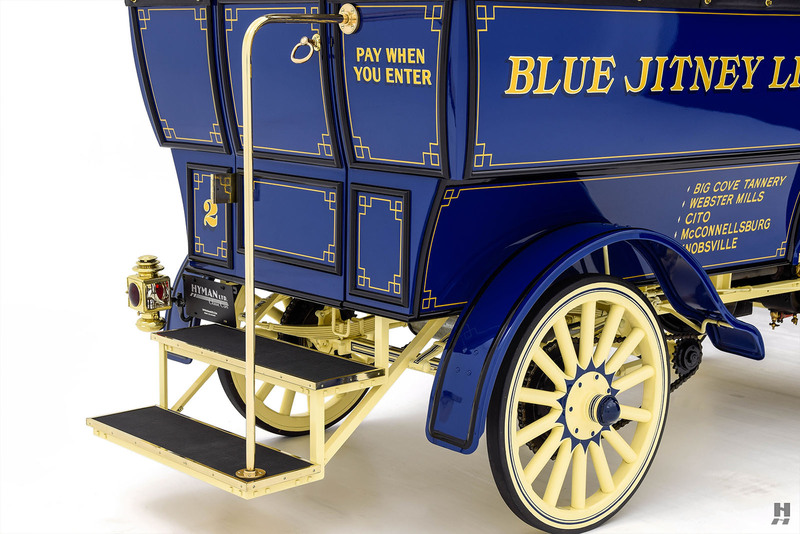 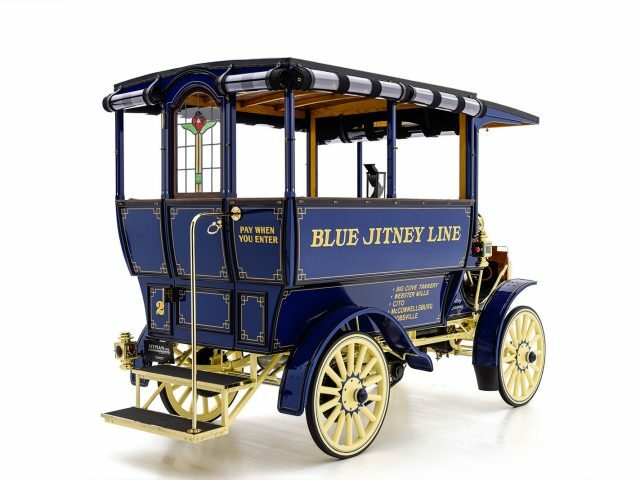 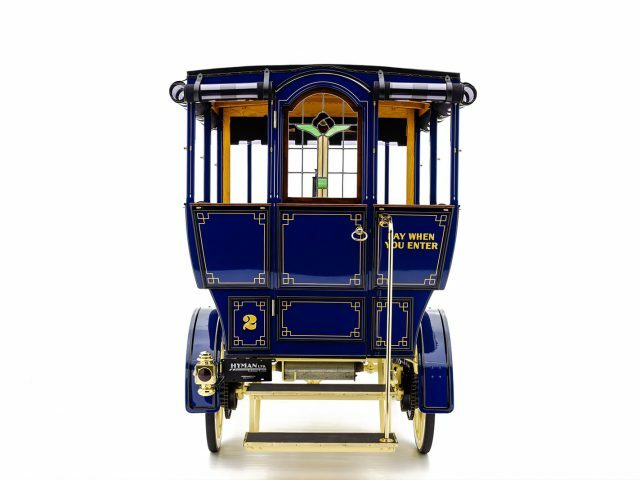 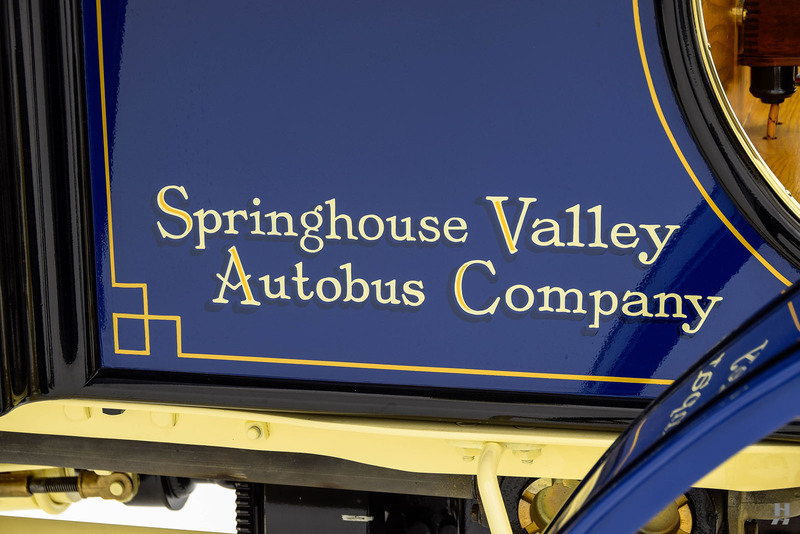 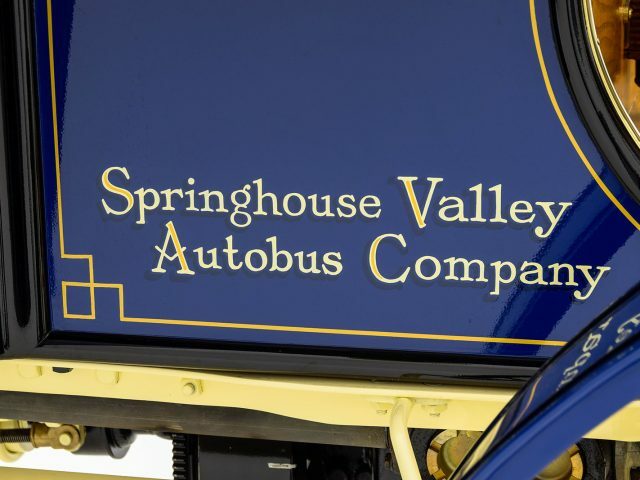 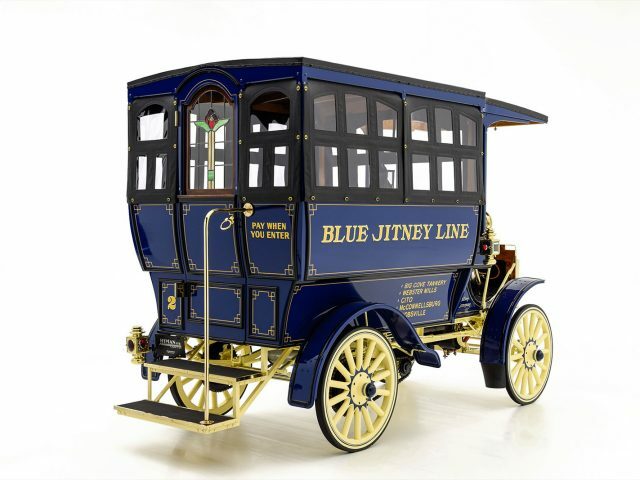 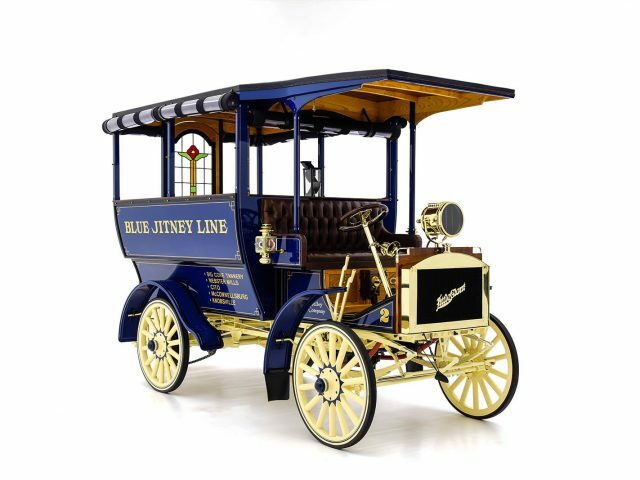 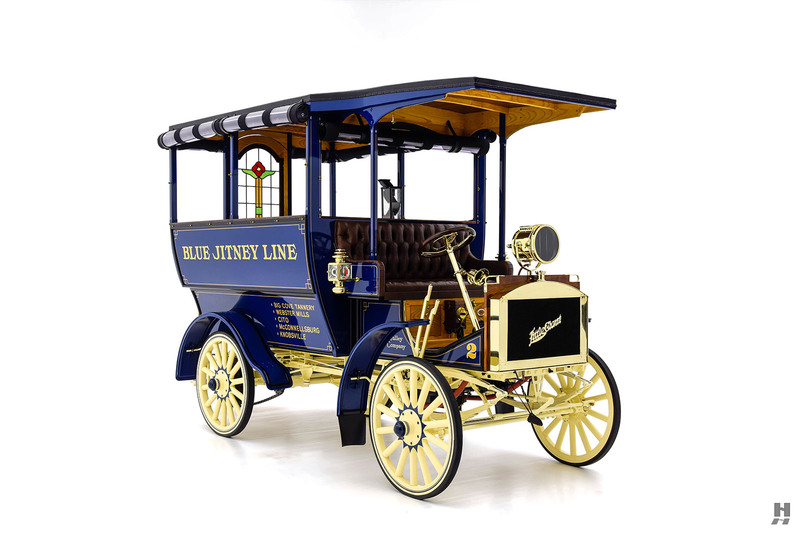 While the specific history of this chassis was not known, the owner created the charming livery to reflect what a period “Jitney Bus” route might have been, linking post-offices near his hometown in Pennsylvania. 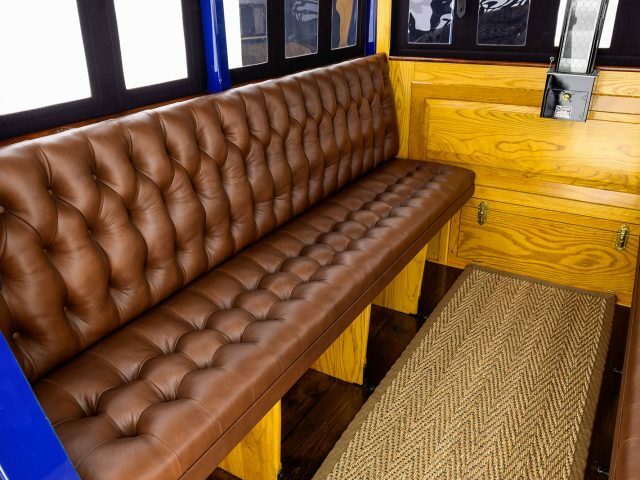 Passengers ride on side-facing benches and enjoy an open-air experience. 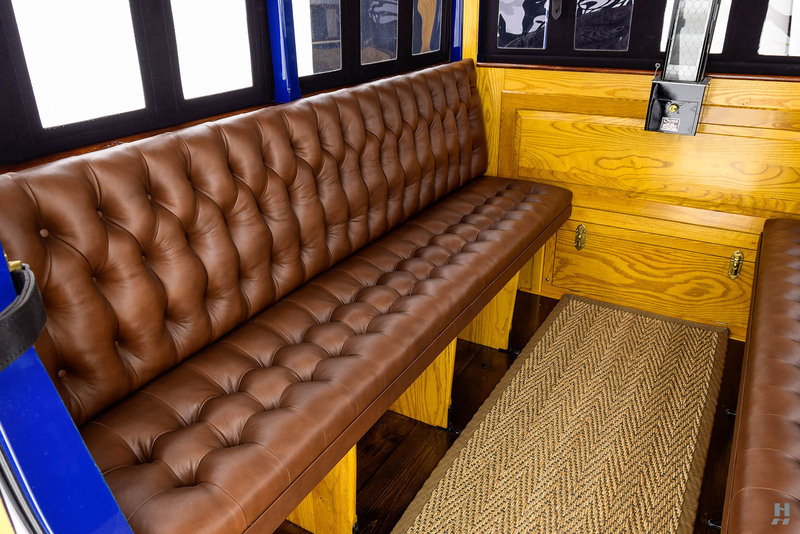 In case of inclement weather, a full set of side curtains can be fitted to keep the rear compartment dry. 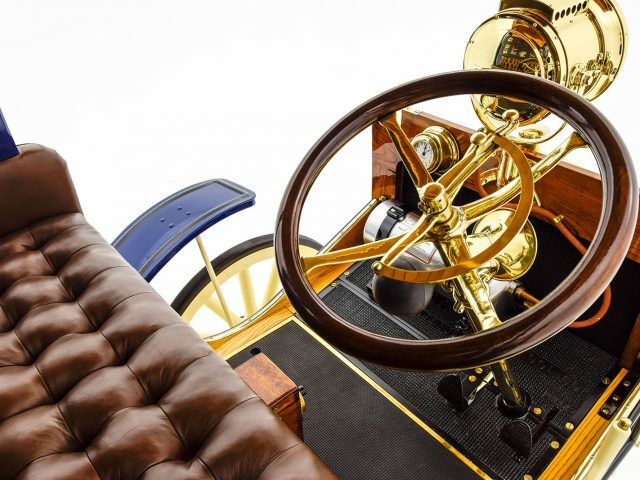 The driver sits exposed up front on a bench covered in finely crafted brown button-tufted leather. 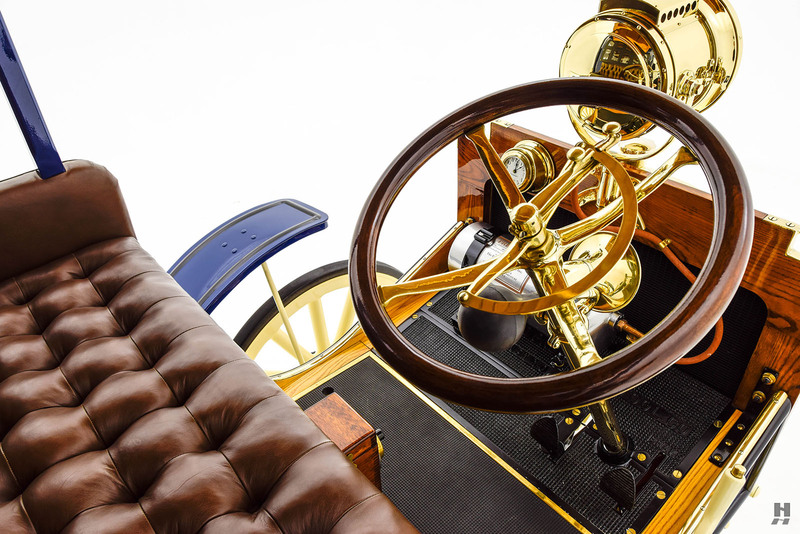 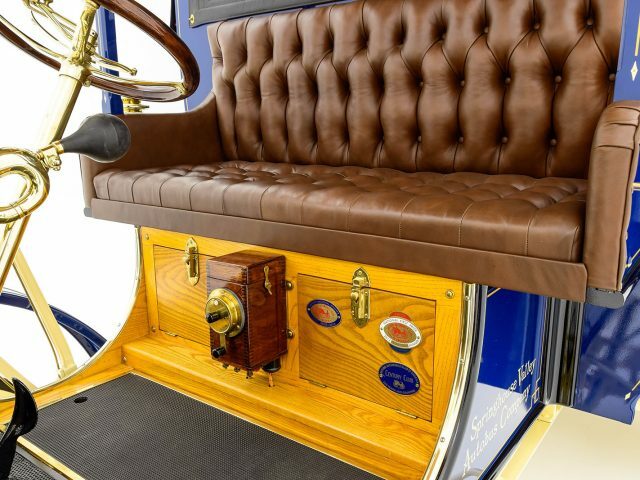 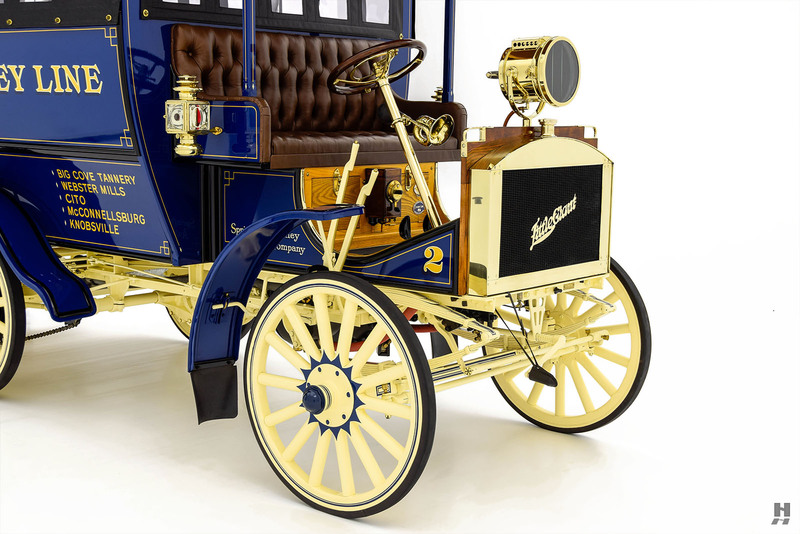 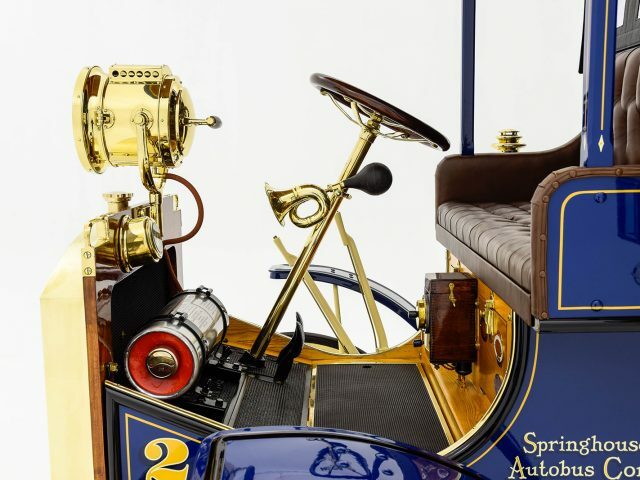 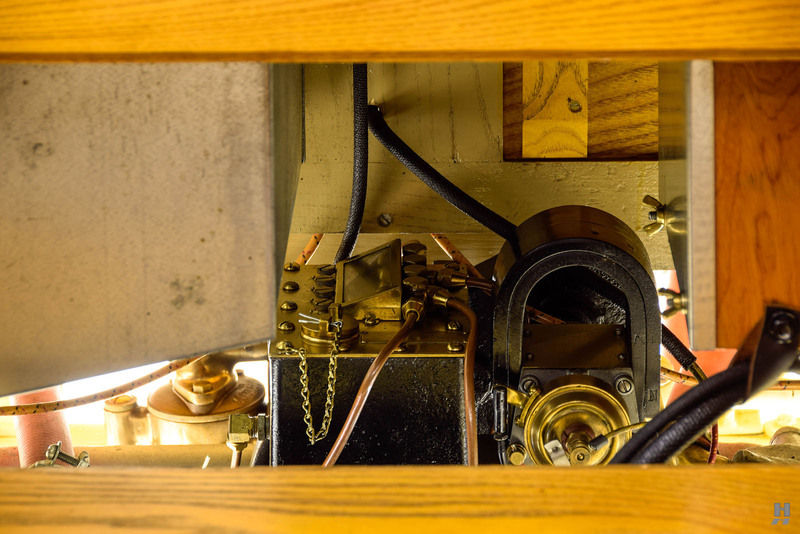 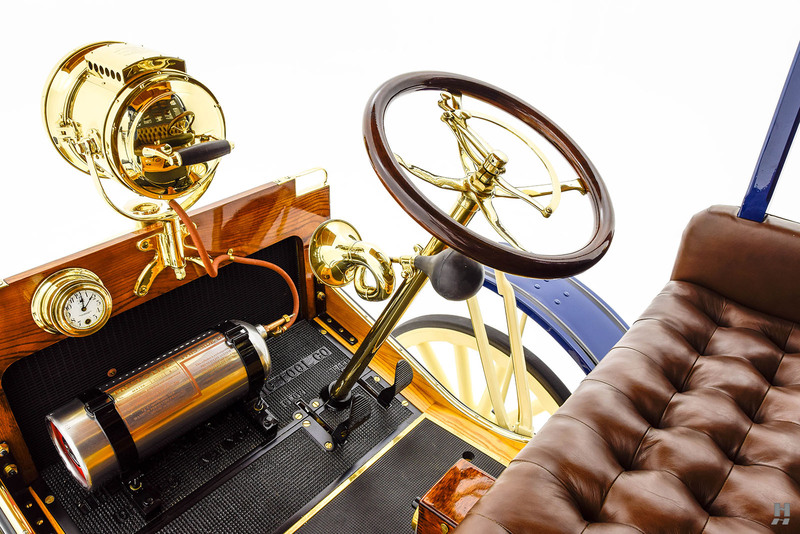 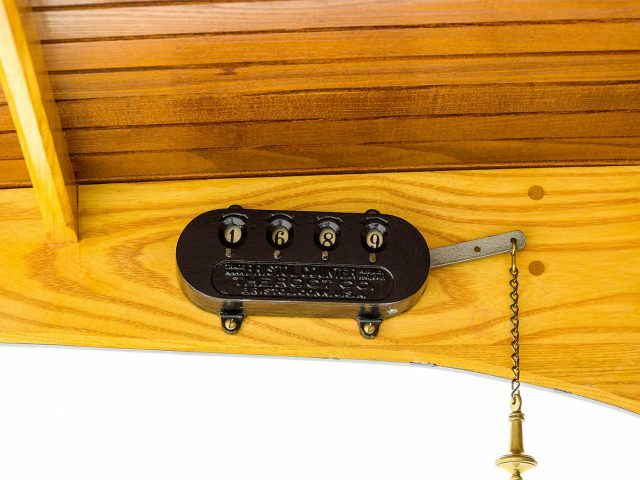 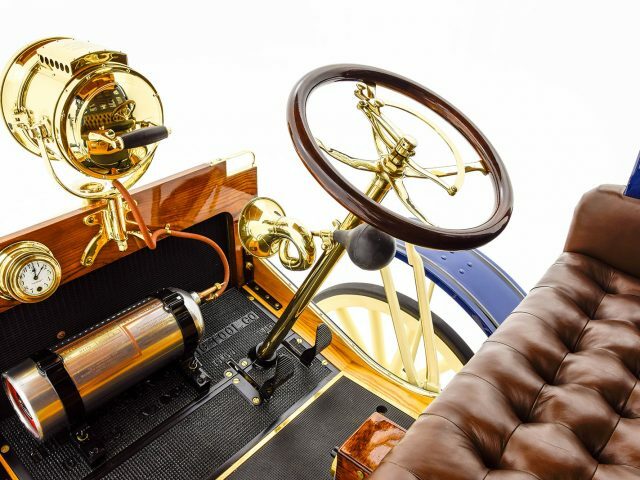 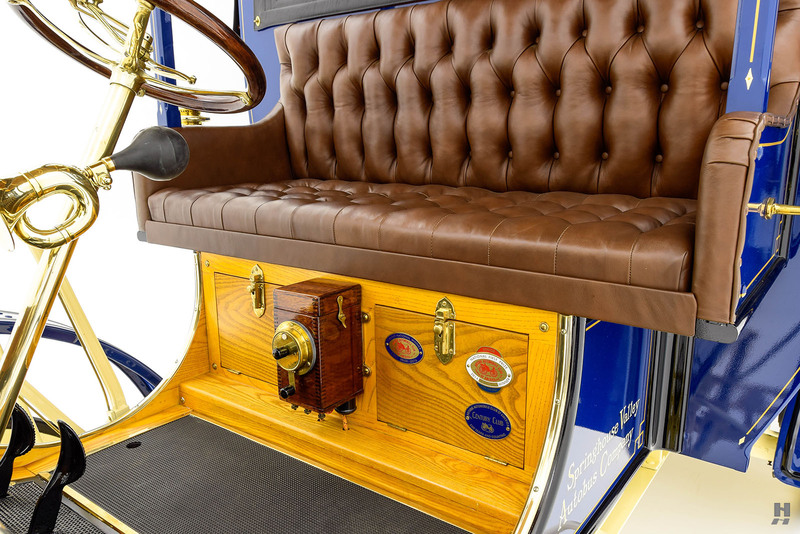 The driver’s compartment features lots of beautifully finished woodwork, and more highly polished brass for the steering column and controls. 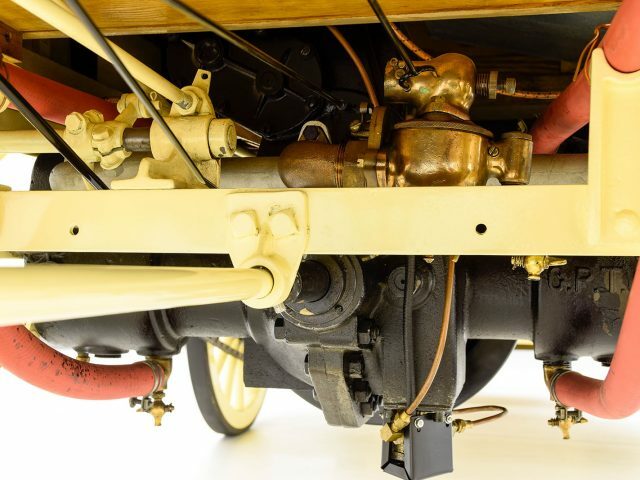 The horizontally opposed two-cylinder Chicago Pneumatic engine runs well, sending power through a two-speed transmission and a chain-driven rear axle. 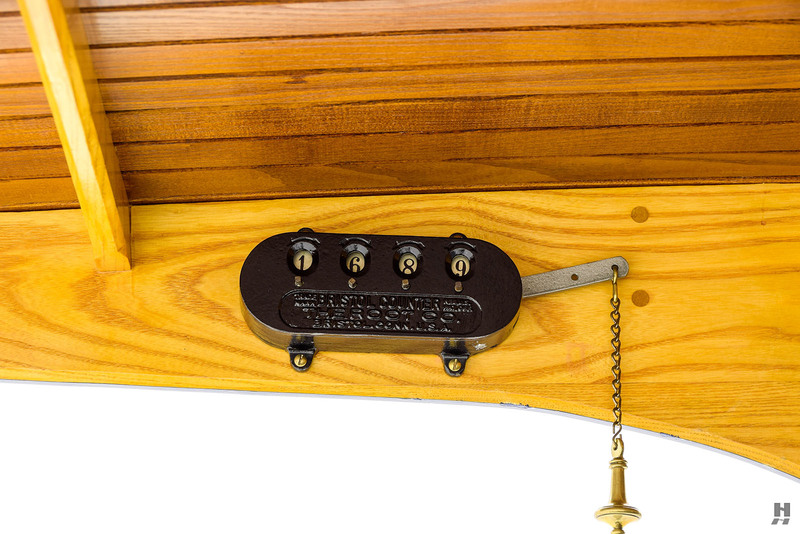 It has been updated with electric start and it starts remarkably easily. 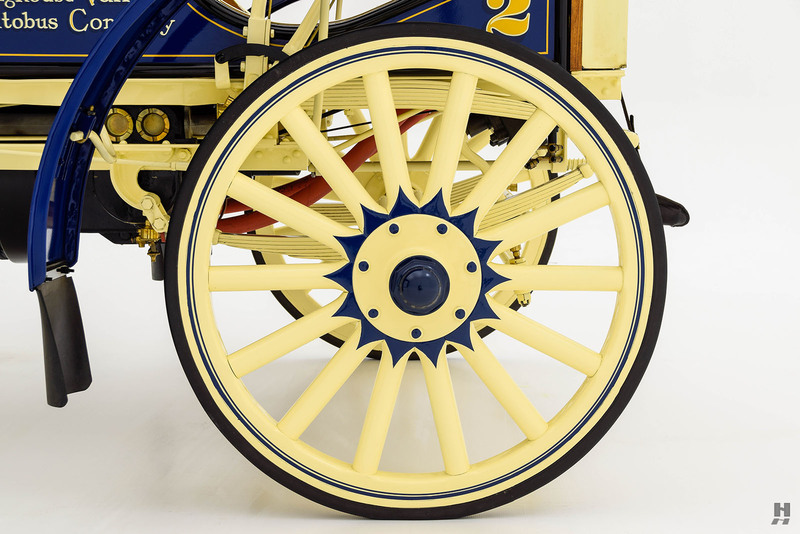 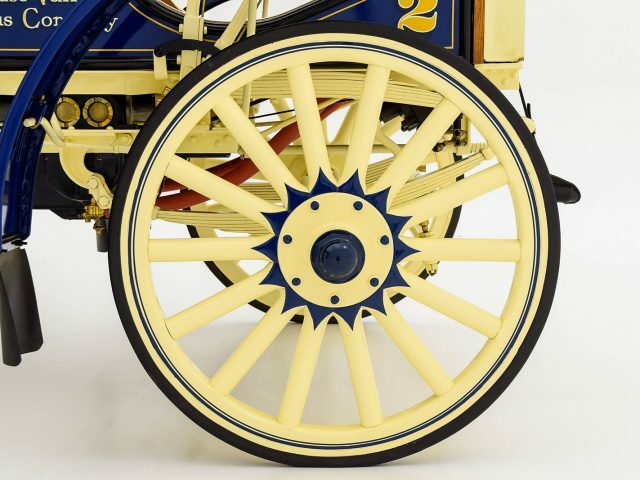 Wooden spoke wheels are wrapped with solid rubber tires, which is very typical for commercial vehicles of this era. 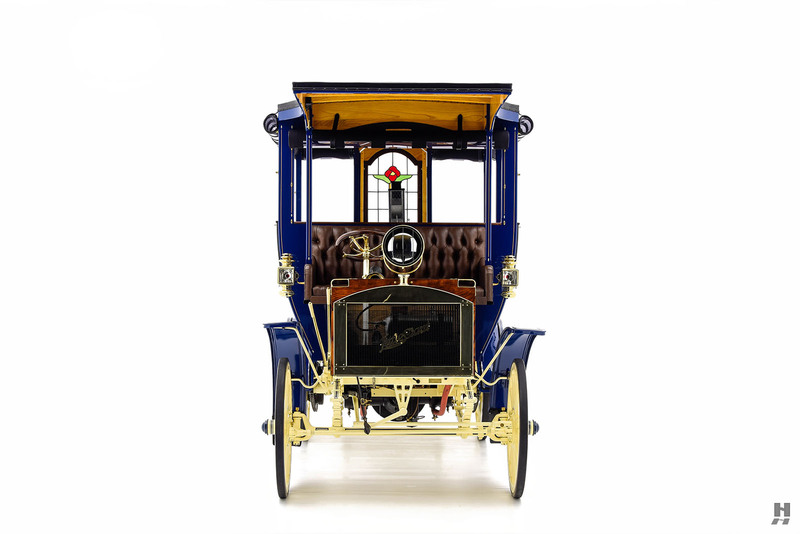 The previous owner drove it on numerous occasions for shows and demonstrations, reporting it remarkably well-behaved considering the one-ton capacity chassis and solid tires. 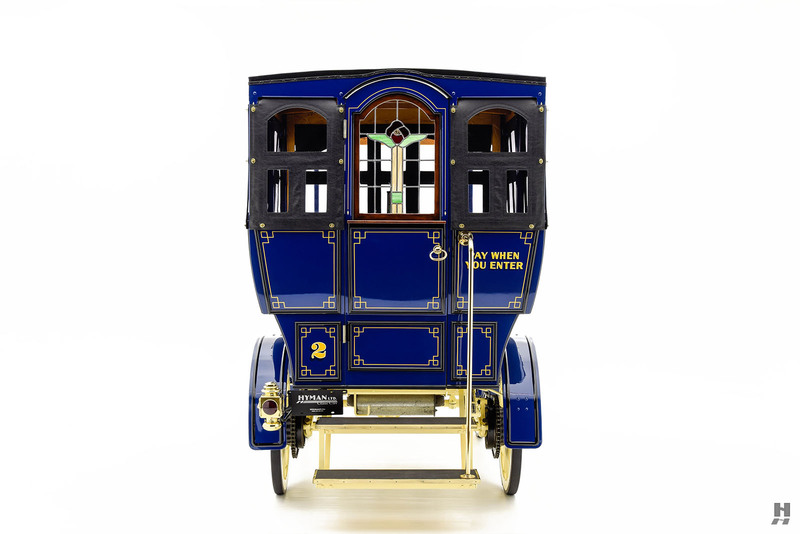 This Little Giant is a stunning and unique period piece that is sure to delight onlookers wherever it goes. 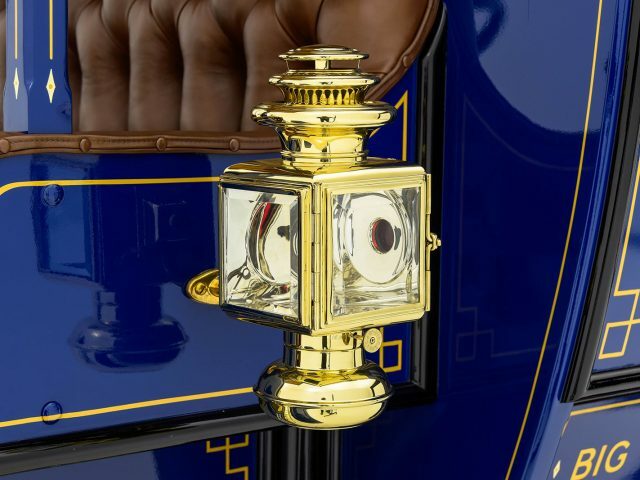 The quality of the restoration is exquisite, and it lives up to its name with tremendous presence. 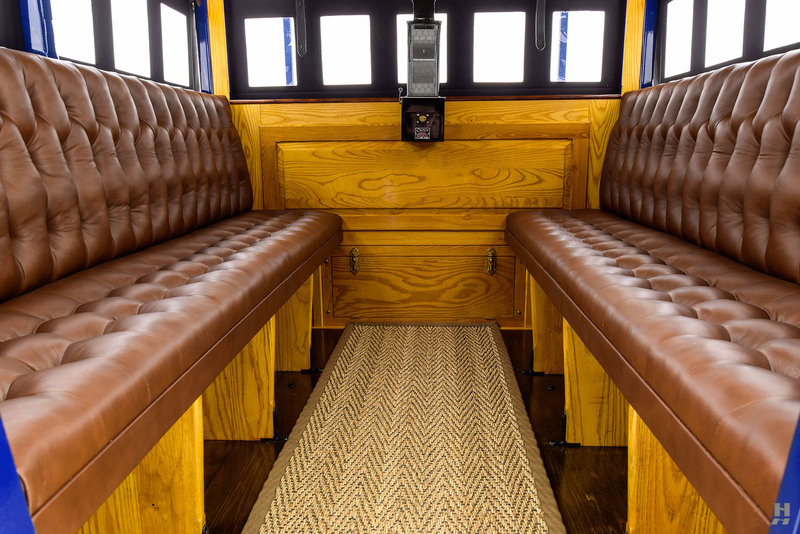 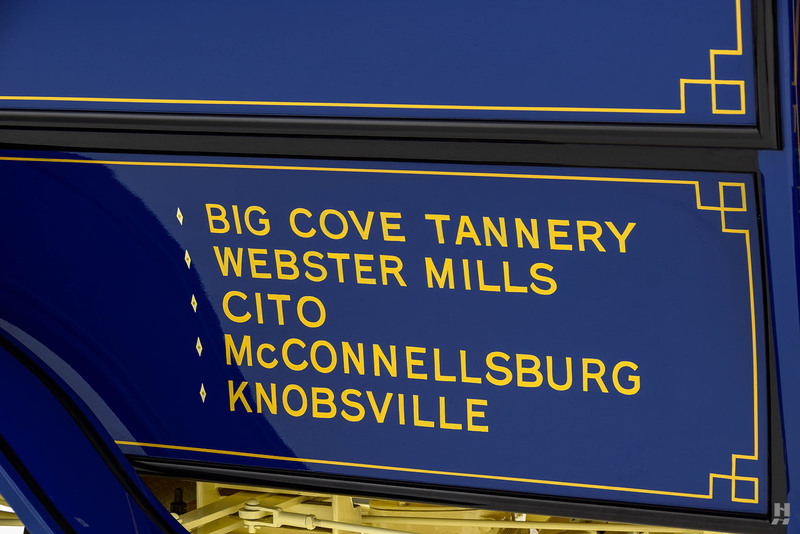 Shortly after the project was completed in 2014, the bus earned its First Junior in the Bus Division at the AACA Spring Meet in Charlotte, NC. 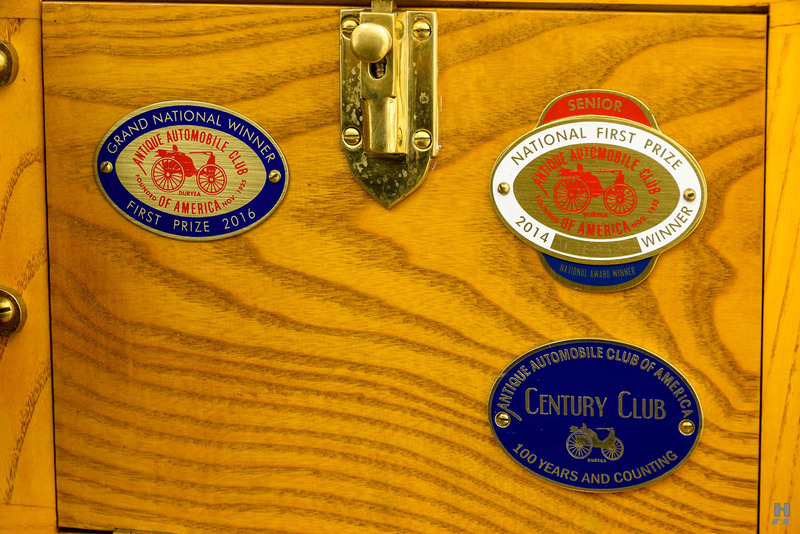 More recently, the Little Giant earned its AACA Senior at the Eastern Meet in Buffalo, NY, and in 2018, it took the coveted People’s Choice Award at the prestigious Elegance at Hershey. 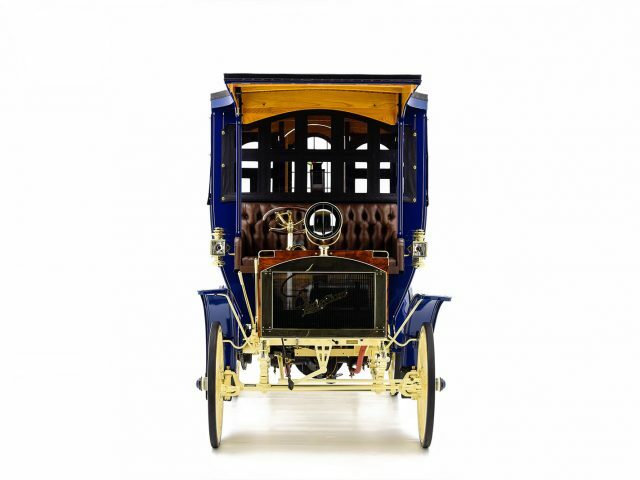 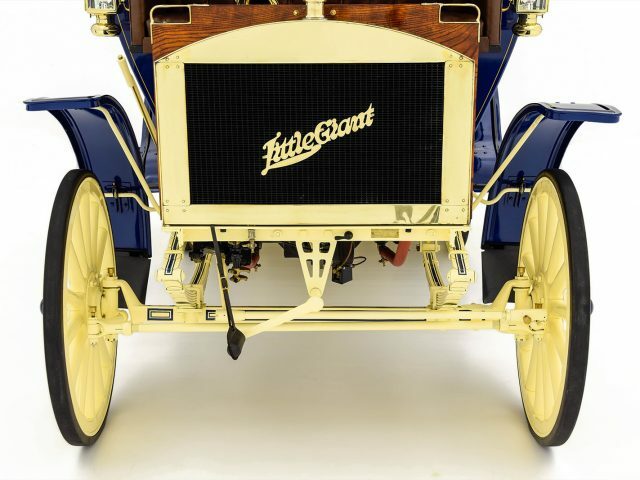 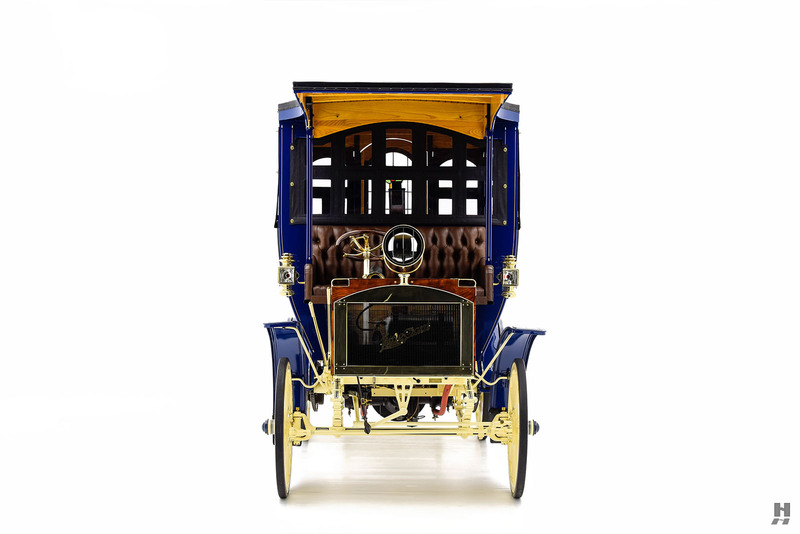 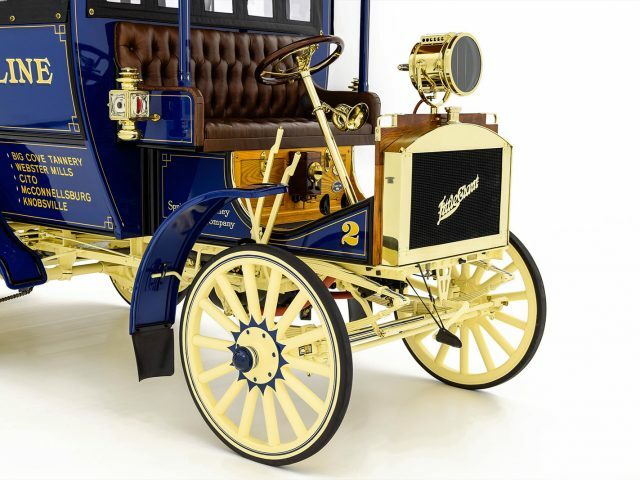 A true one-of-a-kind vehicle, this Little Giant Model D is a fascinating part of the 124-year-old Chicago Pneumatic brand, and is ready for concours events worldwide.